Description: Garden Houses are centrally arranged within the perimeter of a large walled garden, making them extremely safe for families with children. The 1 Bedroom, 1 Bathroom Garden Houses + bunk bed are located either on the ground floor with a terrace. Each has a fully equipped state-of-the-art kitchen along with daily maid service. In this property type there is one master bedroom plus bunk beds in the living area. A free welcome pack is included consisting of:- 1,5 l bottle of water, orange juice, 4 tea bags, 1 package of coffee, 4 capsules of coffee, sugar, 1 pack of Cornflakes, 4 muffins, milk, 4 jams, bread. Occupancy: The price shown here is based on 2 Adults + 2 Children up to the age of 16 sharing a 1 Bedroom Deluxe Garden House with bunk bed. This house may also accommodate an infant under 2 years in a cot. Description: Villa 1 at Martinhal Beach Resort & Hotel enjoys a spectacular location on the edge of a protected natural park and overlooks a picturesque valley that leads down to the sea. 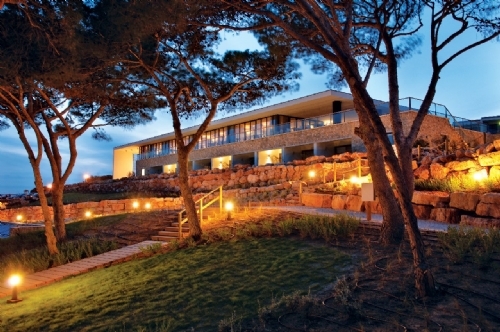 Its elevated position affords fabulous views over the ocean and the nearby port of Sagres. Villa 1 stands in its own landscaped garden and provides wind-protected outdoor dining areas and terraces – ideal for that BBQ get-together. The property is characterised by a decorative and well-appointed interior and features a fully fitted kitchen, under-floor heating and satellite TV. The Master bedroom is upstairs, with a further bedroom on the ground floor, plus a separate guest bedroom with en-suite bathroom that is almost an external “guest cottage”. Villa 1 stands in a landscaped garden and has its own private, 11,5m x 5m heated swimming pool. An extra bed for a child and a cot can be placed in the villa, there is a charge for the extra bed, one cot is free of charge for under 2 years old. A free welcome pack is included. Occupancy: The price shown here is based on 6 people occupying a 3 Bed Luxury Villa with pool. Description: VILLA 10 is one of only two single story villas at Martinhal Beach Resort & Hotel, Villa 10 is an imposing beachfront property overlooking Martinhal Bay. The rear of the building faces a picturesque valley.Villa 10 has three double bedrooms and three bathrooms. Other modern amenities include fully fitted kitchen, laundry room and satellite TV. The living spaces are stylish and welcoming and benefit from under-floor heating, and there is an open fire in the lounge. Being on one level, this villa is perfect for families with young children and for those guests with limited mobility. A stunning covered terrace with patio furniture and built-in BBQ spreads along the edge of a landscaped garden that features a private heated 10,5m x 4m swimming pool with security fencing . A free welcome pack is included. An extra bed for a child and a cot for an infant can be placed in the villa, there is a charge for the extra bed, one cot is free of charge for under 2 years old. A free welcome pack is included. Description: Villa 2 “Andalucia” at Martinhal Beach Resort & Hotel is an amazing three-bedroom property that affords wonderful views over Martinhal Bay and the Sagres peninsula. The villa combines all the modern comforts of your own home with a stylish and decorative interior. Living spaces are generous and inviting and include a lounge, three large double bedrooms and three bathrooms. Under floor heating and an open fire are standard. Amenities also feature a fully fitted kitchen, laundry room and satellite TV. Outside, a stunning covered terrace features a built-in BBQ and an array of patio furniture. An attractive landscaped garden surrounds a 9m x 4m private heated swimming pool. A free welcome pack is included. An extra bed for a child and a cot for an infant can be placed in the villa, there is a charge for the extra bed, one cot is free of charge for under 2 years old. A Free welcome pack is included. A free welcome pack is included. 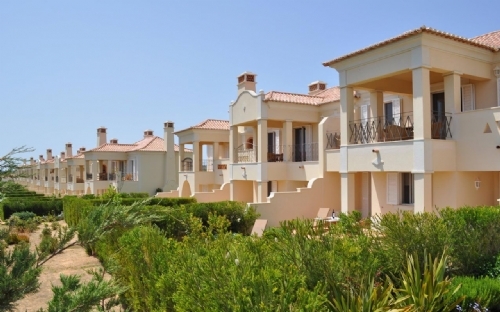 Description: Villa 32 at Martinhal Beach Resort & Hotel is a spacious villa, perfect for great family holidays. All 3 bedrooms are equipped with en suite bathrooms and have direct access to a private garden through sliding doors. The fourth bedroom is internal and has no natural light. The accommodation is upside down, with living spaces created upstairs to take full advantage of the incredible sea views. The villa is fully fitted and equipped throughout with kitchen, laundry room, outside dining area with fitted BBQ, air conditioning and under-floor heating. A beautiful garden surrounds a private heated swimming pool. A free welcome pack is included. An extra bed for a child and a cot for an infant can be placed in the villa, there is a charge for the extra bed, one cot is free of charge for under 2yrs old. A free welcome pack is included. Description: VILLA 35 is a stunning property enjoying spectacular views over Martinhal Bay and Sagres, Villa 35 enjoys an enviable position near the beach. Accommodation is arranged as one Master bedroom suite with an additional lounge room area on the first floor – which could allow for an optional sleeping area for two children. There is one further double en-suite room and one twin bedroom, and three bathrooms in total. Living areas in Villa 35 are spacious and stylish. The well-appointed amenities include a modern, fully fitted kitchen, laundry room, satellite TV and Air Conditioning throughout. A generous first-floor terrace overlooks a pretty south-facing garden with BBQ facilities, and a private heated swimming pool. A free welcome pack is included. An extra bed for a child and a cot for an infant can be placed in the villa, there is a charge for the extra bed, one cot is free of charge for under 2 years old. A free welcome pack is included. 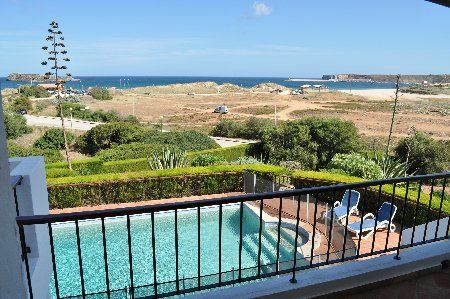 Description: VILLA 38 A well located 3 bedroom villa with enviable views over Martinhal Bay and Sagres peninsula. Located in a cul-de-sac in a quiet area of the resort. The entrance to the property is very inviting with high ceilings. A few steps take you up to the bright living room and the open plan modern kitchen and dining area with a Bluetooth plug and play docking station and satellite TV. There are large patio doors which open out to the Ocean facing balcony with BBQ which is perfect for al-fresco dining. Downstairs are 2 en-suite bedrooms and a further bedroom and separate bathroom. There is also a laundry room. From the bedrooms the patio doors lead out to the private heated swimming pool and the landscaped gardens. A free welcome pack is included. Description: VILLA 44 is a remarkable property of truly singular appeal, Villa 44 “Vista Azul” is a magnificent 3.000-m2 coastal villa that affords uninterrupted ocean views. Open plan in design and complemented by a fashionable interior décor, living spaces at Villa Vista Azul reflect a contemporary taste. Modern conveniences abound and include a fully fitted kitchen with dishwasher, laundry room, a games room with pool table, and a home cinema. The property is air-conditioned and has under-floor heating. Outside, large terraces with a separate BBQ area overlook a landscaped garden and a private heated swimming pool. A free welcome pack is included. Outside: Large landscaped garden, swimming pool with sunbeds. Description: Villa 6 is a modern designed villa with large glass doors and windows which let in a huge amount of natural light. The white architecture perfectly reflects the sky blue pool and the sky. The position of Villa nº 6 gives it guests privacy but outstanding views from the upstairs bedrooms of the ocean. There are 2 bedrooms and 1 bathroom located upstairs and you will find a further bedroom with an en-suite on the ground floor. Also on the ground floor you will also find a fully equipped kitchen, a dining room/living room with satellite TV and direct access to the outdoor area. Occupancy: The price shown here is based on 6 people occupying Villa 6 a 3 bed luxury villa with pool. Description: The stunning position of Villa nº 7 provides its guests with outstanding views of the ocean and the town of Sagres. This property has two floors featuring 3 spacious bedrooms all with en-suite bathrooms. The Master bedroom is located upstairs and you will find a further two bedrooms on the ground floor. Here you will also find a fully equipped kitchen, a spacious dining room as well as a living room with satellite TV and direct access to the outdoor area. The astonishing panorama of the infinity pool, the barbecue area with easy access and the well landscaped garden will all contribute to some great family moments. A free welcome pack is included. An extra bed for a child and a cot for an infant can be placed in the villa, there is a charge for the extra bed, one cot is free of charge for under 2 years old. A free welcome pack is included. We had a great time - 2 related families staying in close- by villas. Very well chosen and very suited to our requirements. 15 people in total. The weather was kind and even when it was raining we found lots to do. Our only complaint would be that the light sensors in the toilets were not timed long enough and in range, for our youngsters to be happy making use of the facilities independently. Description: Villa 8 at Martinhal Beach Resort & Hotel enjoys a privileged location overlooking Martinhal Bay, on the western margin of the resort. The fabulous views take in the beach and the port of Sagres in the distance. One of only two single story villas at the resort, Villa 8 has one double bedroom with en-suite bathroom and two twin rooms with shared bathroom in the hall. Being on one level, this villa is ideal for families with young children and for those guests with limited mobility.A traditional interior with contemporary flourishes defines the interior design, and the living spaces feature a range of modern and fully equipped amenities, including kitchen, laundry room and satellite TV. Under-floor heating is standard throughout.A generous landscaped garden fronts a beautiful terrace with built-in BBQ and an array of patio furniture.The private heated swimming pool within the grounds is fully fenced for security and is therefore ideal for children . A free welcome pack is included. An extra bed for a child and a cot for an infant can be placed in the villa, there is a charge for the extra bed, one cot is free of charge for under 2 years old. Description: Villa 80 at Martinhal Beach Resort & Hotel enjoys a spectacular location with some of the best ocean views at Martinhal Sagres. Ground Floor: 3 bedrooms all with ensuite and patio doors all leading out to the pool. There is also a small kitchenette on this floor which is great to service the pool area. 1st Floor:Large open plan kitchen, lounge and dining room with patio doors leading out to 2 balconies with fantastic ocean views. An extra bed for a child and a cot can be placed in the villa, there is a charge for the extra bed, one cot is free of charge for under 2 years old. A free welcome pack is included. Key features : Floor heating throughout / Heated swimming pool with soft cover. Description: Villa 25 is a fabulously modern 4 bedroom villa with it's own private pool and gardens with sea views. 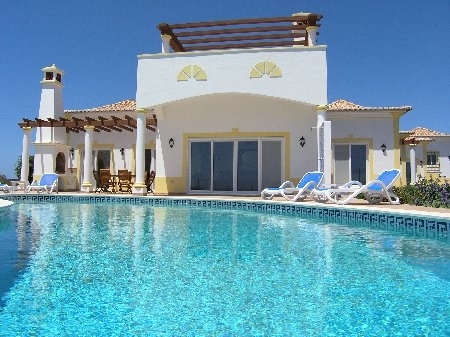 (Please be advised as villa 25 is a new listing more villa information will follow shortly). Occupancy: The price shown here is based on 8 people occupying a 4 Bed luxury Villa with private pool. Description: Villa 26 has four large bedrooms on the ground floor. The kitchen and living area is located on the upper level in order to take advantage of the stunning sea views. The living and dining area is a large bright room with doors opening onto the spacious balcony with views over Martinhal bay. There is a modern and fully equipped kitchen, laundry room and satellite TV along with other amenities. The master bedroom has an en suite and the other two bedrooms share the second bathroom (there is an additional guest cloakroom situated on the upper level). There are zip and link beds supplied to allow for additional flexibility in terms of sleeping accommodation. A private 9m x 4,5m swimming pool is sunk into a generous landscaped garden.A free welcome pack is included. Description: VILLA 27 benefits from uninterrupted ocean views.Accommodation is arranged over two floors, with the principal living space – including a large first-floor terrace – upstairs to take advantage of the spectacular panorama. Downstairs, the property comprises a beautiful Master bedroom suite with fitted wardrobes and a huge en-suite bathroom decorated with natural stone tiles. Villa 27 also has a further double bedroom and 2 twin bedrooms with zip and link beds that can be configured as a double if required. These two bedrooms share a family bathroom. Fully fitted and equipped throughout with kitchen, laundry room, satellite TV and other amities, the villa stands in its own private garden complete with heated swimming pool. A free welcome pack is included. An extra bed for a child and a cot for an infant can be placed in the villa, there is a charge for the extra bed, one cot is free of charge for under 2 years old. Occupancy: The price shown here is based on 8 people occupying a 4 bed luxury villa with pool. It is a great holiday location for any adults with kids. The whole resort is kiddy friendly. All the restaurants gave special areas for the kids to play while you eat. There is endless toys for children so don't need to bring own along with cots, steps, party's, highchairs, plates etc. The villa was equipped with everything you need for every generation and even stair gates. There was a kids club which we did not even have time to use. The beach was lovely and clean. The shop had everything you needed for the kids and loads of pouches hut pretty expensive so best to order it from boots and pick it up after security so you can take it as hand luggage. Loads of pools on the resort and tennis and football pitches. The only down side about resort was the wind at times. Sometimes just too windy to be on beach but plenty more to do. Good gym but could have more cross trainers. Nice variety of restaurants and menus clearly state what each dish has in... shellfish, gluten, dairy, lactose etc. Not top far from the airport and if you book a transfer through resort car seats are provided. Daily cleaning service of the villa is great. The villa is very well equipped in kitchen so can cook near enough anything. It is fully kitted out with top of range washing machines, n espresso machine, oven, microwave etc. Beach and bath towels included as well as shampoo and conditioner. Def loved our stay. Description: VILLA 29 is orientated towards the beach, with wonderful views across Martinhal Bay, Villa 29 “Casa da Praia” is appointed throughout to exceptionally high standards. Villa 29 comprises of 3 twin bedrooms of which 2 are en-suite and one large double bedroom en-suite. The living spaces generate a welcoming ambiance that is enhanced by a stylish interior décor. Under-floor heating and an open fire add the finishing touch. Modern and fully equipped with kitchen, laundry room and satellite TV among other amenities, the property features an attractive covered terrace with a built-in BBQ and a set of patio furniture. A private 7,5m x 4m heated (solar) swimming pool is sunk into a generous landscaped garden. A free welcome pack is included. An extra bed for a child and a cot for an infant can be placed in the villa, there is a charge for the extra bed, one cot is free of charge for under 2 years old. Description: VILLA 92 offers great accommodation with 5 bedrooms, 4 bathrooms and is set in beautiful landscaped gardens of around 4600 sqft and offers peace, tranquillity and total privacy. The entrance hall leads to the living area which has comfortable sofas, satellite TV, DVD and everything you need to relax in the evenings. The dining area is open plan to the lounge with large patio doors giving easy access to the heated pool and sun terraces. The kitchen is fully equipped and there is also a utility room with washing machine, dryer and wine fridge. Outside there is a cooking area with sink and BBQ with table and chairs in the covered dining area. There is downstairs an accommodation wing with 2 double bedrooms, W.C. and 2 bathrooms. Upstairs there are a further 3 bedrooms and 2 bathrooms. All bedrooms have patio doors which lead out either to a terrace or a balcony. 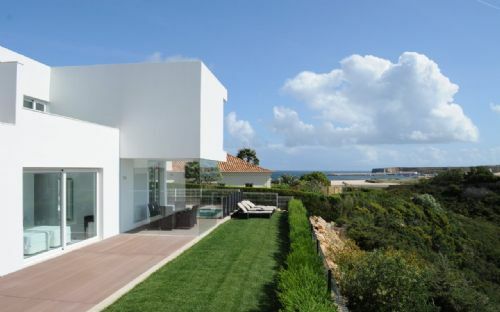 The villa also benefits from air-conditioning throughout and under floor heating. Activity-focused resort, ideal for the whole family. There is a free welcome pack on arrival. Occupancy: The price shown here is based on 10 people occupying a 5 bed luxury villa with pool. Description: A fantastic luxury 5 bedroom villa built to an extremely high standard and with attention to detail. Fitted-out with highest building specification and combines modern comfort with stylish interior. 4 double & 1 twin bedroom, all with en suite. Fully fitted kitchen with separate laundry room with washer / dryer. Extra features include : safe , satellite tv / dvd player. Outside: Landscaped garden with heated swimming pool (hard cover when not in use / evening) & BBQ area. Activity-focused resort, ideal for the whole family. There is a free welcome pack on arrival. Occupancy: The price shown here is based on 10 people occupying Martinhal villa number 18 - 5 bed luxury villa with pool. Description: Villa 21 at Martinhal Beach Resort & Hotel is an amazing family friendly 5-bedroom private villa measuring roughly 3,300 sqft (400 sqm) – the largest villa in our private villa collection at Martinhal Beach Hotel & Resort, Algarve. 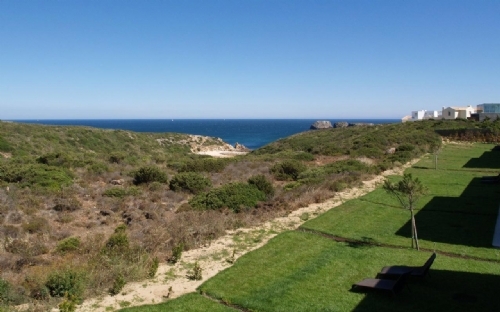 The house has wonderful views over Martinhal Bay and the Sagres peninsula. It is located on a large 33,000 sqft (4,000 sqm) plot with its own private pine forest as part of its lush garden. 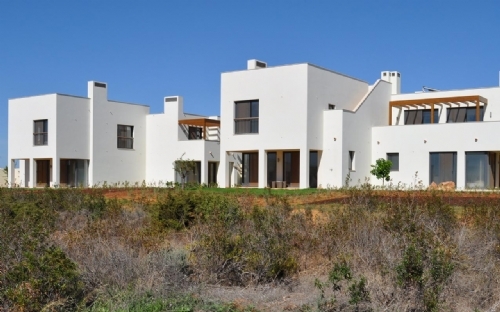 This privately located villa at a cul-de-sac within this renowned family resort in the Algarve combines all the modern comforts of your own home with a stylish interior. Living spaces are generous and inviting and include an entrance area with an entrance cloak wardrobe, dining area, lounge, second family lounge and play area in the basement, five large double bedrooms and five bathrooms. 2 of these bedrooms are located exclusively on the upper floor – both with ensuite bathrooms and dressing areas. There is also a study/ library area upstairs. Guests have access to a large fully- fitted Miele kitchen with large fridge-freezer, dishwasher, microwave, oven and other standard fittings. There is a separate laundry room with washer and dryer. Satellite TV available. The house has underfloor heating, a fireplace as well as air-conditioning. Wi-fi throughout the house. Outdoor areas are beautifully appointed: 2 BBQ terraces and a pool terrace with an attractive private landscaped garden with a 10m x 4m private heated swimming pool. A free welcome pack is included. An extra bed for a child and a cot for an infant can be placed in the villa, there is a charge for the extra bed, one cot is free of charge for under 2 years old. Description: Villa 77 at Martinhal Beach Resort & Hotel can easily accommodate ten guests and is located on the eastern margin of the resort overlooking the beautiful natural park and the ocean. The bedrooms and living areas are fitted out in a comfortable informal way, with a wonderful sense of space. In addition to the generous living room and the fully fitted kitchen, the property also offers a games room where you can play ping pong and table football. Outside, a large terrace with a suite of patio furniture overlooks a private heated swimming pool sunk into a well landscaped garden. Other amenities include BBQ facilities and a Jacuzzi located in a secluded area of the garden. A free welcome pack is included. Description: A fantastic luxury 5 bedroom villa built to an extremely high standard and with attention to detail. Wonderful views over Martinhal Bay and the Sagres peninsula. Fitted-out with highest building specification and combines modern comfort with stylish interior. Ground: Lounge, dining room, kitchen and utility room. The kitchen is a fully integrated top quality oven, hob, small fridge and dishwasher. Utility room with fridge/freezer, washing machine and dishwasher. Guest W/C, 4 double bedrooms, one with en suite, and 3 separate bathrooms with shower cubicles. Description: Beach Rooms at the Martinhal are arranged in clusters of 4, close to the main hotel building and a short walk from the beach. These spacious, light and airy rooms are positioned just one row back with partial Ocean Views. With facilities such as flat screen TV, I-Pod Docking Station, Safe and a bottle of water plus 2 Nespresso capsules (per day). Double walk in shower and bath. Occupancy: The price shown here is based on 2 Adults sharing a beach room with Partial Sea Views / breakfast. 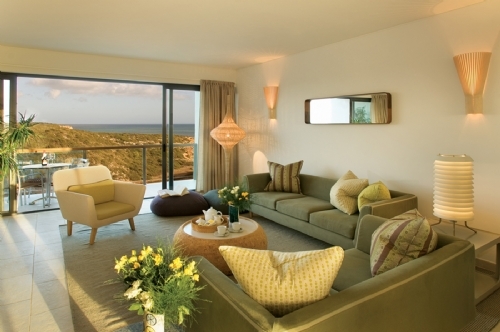 Description: Beach Suites at the Martinhal are positioned overlooking the ocean. The Beach Suite is double storey in a loft-style with an open plan bedroom on the mezzanine. This leads out on to a large private terrace to capture the setting of the sun. The floor to ceiling windows floods the suite with light. Downstairs the sitting area opens out to a private terrace and there is a separate bathroom. 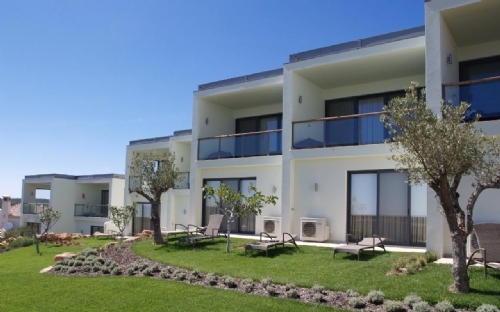 Beach Suites can interconnect with beach rooms making them ideal for families. Occupancy: The price shown here is based on 2 Adults plus an infant under 2 years sharing a beach suite with breakfast. Description: Hotel Terrace Rooms can be found within the main hotel building. Each en-suite room has its own wood deck terrace and an area of lawn where guests can lounge and soak up the sun, taking in the fantastic sea views. All Terrace/ Beach rooms have air-conditioning, are non-smoking and have daily maid service. Occupancy: The price shown here is based on 2 Adults sharing a terrace / beach room room with Full Sea Views / Breakfast. Description: Garden Houses are centrally arranged within the perimeter of a large walled garden, making them extremely safe for families with children. The 1 Bedroom, 1 Bathroom Garden Houses are located on the first floor with a balcony. Each will have a fully equipped state-of-the-art kitchen along with daily maid service. A free welcome pack is included. Occupancy: The price shown here is based on 2 Adults + plus an infant under 2 years in a cot. Occupancy: The price shown here is based on 2 Adults + 3 Children under 16 sharing a 2 Bedroom Grand Deluxe Bay House with bunk beds. Occupancy: The price shown here is based on 4 people sharing a 2 Bedroom Grand Deluxe Bay House. With a 3 and a 2 year old I was always told holidays are just the same as being at home but somewhere else, I can honestly say that's not true. We had such a great time, the food was delicious, the pools were so varied and clean, the play areas were creative, the staff were natural and so friendly. Everything was near to hand and made easy, it really was our best holiday. There was time to relax and to enjoy a family holiday. The kids club was fine but we only used it once, to go dolphin watching, as we didn't feel the need, it was fine to just hang out. Great cocktails too! Occupancy: The price shown here is based on 4 people sharing a 2 Bedroom Grand Deluxe Garden House. Excellent resort for children. Villa good with lots of space. Weather is windy and can be cloudy so a car recommended to explore the Algarve coast and escape the cloud. Food good. Occupancy: The price shown here is based on 4 people sharing a 2 Bedroom Grand Deluxe House Ocean Views. Description: Grand Deluxe Ocean Houses with partial ocean views are located in the heart of the resort. They are arranged in small terraced groups. Ocean Houses are arranged upside down with the living area upstairs so that you can take full advantage of the partial ocean view. All Ocean houses have 2 bedrooms and 2 bathrooms with a fully equipped state of the art kitchen. Your own private terrace with terrace furniture, daily maid service and a free welcome pack on arrival. Occupancy: The price shown here is based on 4 people occupying a Grand Deluxe Ocean House with partial ocean views. 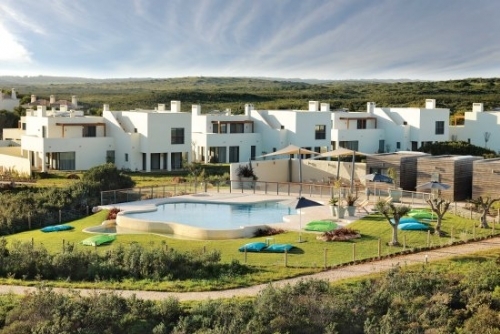 Description: Pinewood houses are located in a separate 'close' with easy access to the main resort facilities. Each house has its own private swimming pool with removable safety barriers for complete peace of mind. The houses are furnished to the highest standard and include 32in satellite TV with multichannel selection and video on demand, wireless internet access and MP3 docking station. Modern conveniences include designer kitchen and washing machine and dryer. Village Houses benefit from a daily maid service and guests can if they wish pre-order meals for home delivery. Breakfast or Half Board can be booked at a supplement. A free welcome pack is included. Occupancy: The price shown here is based on 4 people sharing a 2 Bedroom Grand Deluxe Pinewoods House with private pool. Description: Mimosa Villas are a terrace of individually owned Luxury Townhouses, they are contemporary in design yet retain a traditional feel. Each Townhouse is air-conditioned , has state-of-the-art kitchen, TV and DVD player. Each Townhouse has a small, hedge enclosed garden, super for families. Guests staying at Villas Mimosa have the use of an exclusive heated pool and of course can use all the facilities of the Martinhal Resort. A free welcome pack is included. Occupancy: The price shown here is based on 4 people sharing a 2 Bedroom Mimosa Villa. Occupancy: The price shown here is based on 6 people sharing a 3 Bedroom Master Deluxe Bay House. We visited martinhal 5 years ago with our eldest and was looking forward to returning with now our second and third children (8, 4 and 2). The villa was impressively immaculate, no real Signs of wear and tear. The kids club was great and all 3 really enjoyed a few sessions there. The resort was busy, being half term, but we always found space by the main pool. Staff all over the resort could not be friendlier and it has a smart but family friendly feel. The only aspect which was slightly disappointing was the service at times. Arriving at 1130 pm after a delayed flight, we waited 30 mins to check in with 3 very tired children in the car and bed guards had not been fitted, despite advance request. Our kids club and tennis lesson bookings which we had had email correspondence about in advance, had not been made and we were told the club was full..despite there being availability when we had emailed at first to make the request. 5 phones calls and lots of time was wasted on our first day to sort it out. Service in the cafes and restaurants also seemed incredibly slow - regularly 15 mins for a drink, 45 mins with no food etc which is ok for adults having a long lunch but tricky with hungry little ones. Overall though, we love this place and for a family of 5 with different ages to satisfy, had a fantastic week. I really recommend this place, it's not too big to get around with little ones and is smart enough for grown ups. I am sure we will return. Description: Master Deluxe Garden Houses are located within the perimeter of a large walled garden, making them extremely safe for families with children. The semi-detached houses have 3 bedrooms and 2 bathrooms with a fully equipped state of the art kitchen. You have your own terrace with terrace furnitue which opens on to a beautiful garden. Daily maid service and a free welcome pack on arrival. Occupancy: The price shown here is based on 6 people occupying a Master Deluxe Garden House. The house is decorated in an understated but luxurious way. Any needs were quickly addressed. Great selection of pools/beach options. Great food. Pricey, but ultimately quite worth it for something that gave both kids and grandparents a happy week. Also meant we could be here with other extended family without being in each other's pockets. Description: Ocean Houses are located right in the heart of the resort. They are arranged in small terraced groups. The Ocean Houses are arranged upside down with the living area upstairs so you can take full advantage of your breathtaking Sea View. All have 3 bedrooms and 2 bathrooms and a fully equipped state-of-the-art kitchen. You have your own private terrace on which you can enjoy an al fresco meal whilst watching the sun set! Daily maid service is included too! A free welcome pack is included. Occupancy: The price shown here is based on 6 people sharing a 3 Bedroom Master Deluxe House Ocean Views. This is the 5th time we have been to Martinhal and each time the resort gets incrementally better. The house is great, the food is tasty and heatlhy, and the beach is perfect. We shall be coming back again very soon. Description: Master Deluxe Ocean Houses with Partial Ocean Views are located in the heart of the resort. They are arranged in small terraced groups. The Ocean Houses are arranged upside down with the living area upstairs so that you can take full advantage of the view. There are 3 bedrooms and 2 bathrooms with a fully equipped state of the art kitchen. You have your own private terrace with terrace furnitue. Daily maid service and a free welcome pack on arrival. Occupancy: The price shown here is based on 6 people occupying a Grand Deluxe Ocean House with partial Ocean Views. Occupancy: The price shown here is based on 6 people sharing a 3 Bedroom Master Deluxe Pinewoods House with private pool. Great holiday, villa was fantastic, restaurants were great and overall was spot on. Would recommend if you have young children as the set up is well thought out and family friendly. Description: Villas Mimosa are a terrace of individually owned Luxury Townhouses, they are contemporary in design yet retain a traditional feel. Each Townhouse is air-conditioned , has state-of-the-art kitchen, TV and DVD player. Each Townhouse has a small, hedge enclosed garden, super for families. Guests staying at Villas Mimosa have the use of an exclusive heated pool and of course can use all the facilities of the Martinhal Resort. A free welcome pack is included. Occupancy: The price shown here is based on 6 people sharing a 3 Bedroom Mimosa Villa.